Arabic botanical treatise. Unknown author and date. ... the young birds hatch out, the bees reproduce, the creatures of the sea begin their migration; our womenfolk begin to incubate the silkworms; the cranes return to the river islands. Saffron bulbs are planted and summer vegetables sown; many trees are already in leaf. There are truffles, wild asparagus and fennel in abundance. Pear trees and apple trees are grafted, young cuttings planted, and the vine shoots transplanted. We may be bled and, if need be, take our medicines, though they must not be too strong. This is also the month during which instructions on recruitment for the summer months are issued. Swallows and storks return to their nests in the towns. 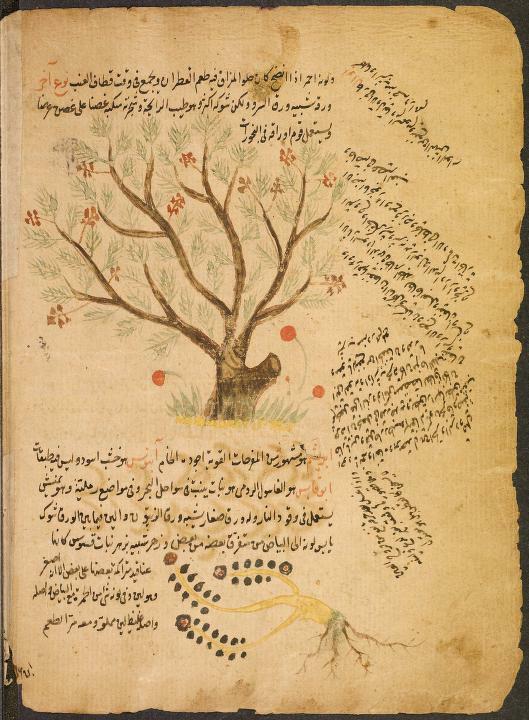 The purpose of the Filāḥa Texts Project is to publish, translate and elucidate the written works collectively known as the Kutub al-Filāḥa or ‘Books of Husbandry’ compiled by Arab, especially Andalusi, agronomists mainly between the 10th and 14th centuries (see Authors & Works). These systematic and detailed manuals of agriculture, horticulture and animal husbandry have been somewhat neglected and remain largely unknown in the Anglophone world - apart from some of the Yemeni works they have never been translated into English. They not only provide primary source material for the understanding of what has been called the ‘Islamic Green Revolution’ but constitute a rich body of knowledge concerning a traditional system of husbandry which is as valid today as it was a thousand years ago and has much relevance to future sustainable agriculture. See Introduction. The Filāḥa texts are preserved in some 240 manuscripts scattered in libraries and institutions in 40 different cities, mainly in Europe, the Middle East and North Africa. See Map of Holding Institutions. To bring to a worldwide English-speaking readership the current state of knowledge on the Filāḥa texts and their authors, especially the findings of Spanish scholars J.M. Carabaza Bravo and E. García Sánchez who have worked in this field for the past twenty-five years. To them we owe a huge debt of gratitude. See Bibliography. To gather a corpus of digitized manuscripts, Arabic editions and English translations of Filāḥa texts on one site. See Texts & Translations. To provide a variety of scholarly online resources such as glossaries, bibliographies, published articles, links, etc. See Articles & Resources. To encourage interest and research in the field, and provide a locus for the publication of scholarly and more popular articles on the Filāḥa manuals and traditional farming in Arab and Islamic lands in general. To provide a forum for discussion and the exchange of ideas among scholars engaged in the field. Register to join the Forum here. The Filāḥa Texts Project is coordinated by Dr. Karim Lahham and is part of a wider programme to document and study the rich heritage of traditional farming, water management and land use systems in the dry lands of the Middle East and North Africa. This project began under the auspices of the Golden Web Foundation, Cambridge, and was supported by them until 2011. The Qatar National Food Security Programme then proceeded to provide support from September 2012 to March 2014, under the then project coordinator Simon Fitzwilliam-Hall. Articles, academic papers, translations, glossaries, bibliographies, reviews, photographs, etc. are welcome and should be sent to Dr. Karim Lahham at laham1300@yahoo.co.uk.